A senior intern? This is definitely something new. The thought of the possible problems both the company and the senior might encounter makes the movie a hilarious one even before I’ve watched it! But lo and behold, I was surprised by how relatable the film was. Anne Hathaway playes Jules, an entrepreneur of a successful online shopping company (or you can say blogshop). Remember how so many blogshops popped up several years ago, this is a peek into the world behind an online shop, a career many people dream of doing, tried doing but failed due to several reasons. What made this film so enjoyable? The plot is simple, but the characters were full of surprises. I thought the staff in the company would be the ones who couldn’t accept Ben (Robert De Niro) a senior intern, but I was wrong. Not only did they guide him, they embrace his experience. I thought Jules (Anne Hathaway) would be receiving. But she was the one with the most bias against him. The great “men jokes” were hilarious in a not-crude way. It won’t be surprising if they were crude, but I was delighted by how the old intern “embraced” the time with the young staff. Yes, he had a difficult time adapting the pace and the environment, but Nancy Meyers did it in a lighthearted and sweet way. So sweet that when Ben revealed to Jules his past, it was heart-breaking. The supporting characters were nicely conceptualised and personalities well thought out too! There’s Rene Russo as Ben’s new love interest, the staff from the company – Adam DeVine as Jason, Zack Pearlman as Davis, Jason Orley as Lewis and Christina Scherer as Becky. They displayed the classic behaviours of the Millenniums (Gen Y) adults and how they handle relationships. You should totally check out their brilliant solution to retrieving email sent to the wrong person. Robert De Niro is the kind of cool granddad you hope to have, even when you are 27 (like me) now. He’s interaction with Jules’ daughter Paige (JoJo Kushner) was endearing, but kept to the minimal. He is great delivering his thoughts with just his expressions, which I believe why Jules found him too scarily “observant”. A few friends of mine had a different voices in regards to the final choices Jules made. For the benefit of those who haven’t watch it, I won’t try to spoil too much as to what the problems and choices are, but a young woman juggling the roles of a boss of a 220-employee fashion company, a wife to a home-husband, a mum to an adorable girl, it’s not difficult to guess what were the possible crisis she was facing. Aside from the one little strange facy that Jules, a smartphone-obsessed person did not grab her phone and laptop during a emergency evacuation, this near perfect film is so likeable that it is not hard not to like it, unless you dislike films that does not involve guns, bombs or an evil guy (antagonist). Nancy Meyers got Jack Nicholson for the role of Ben Whittaker before going to Robert De Niro. Tina Fey and Reese Witherspoon was originally casted but they dropped out and Anne Hathaway replaced her. This is the third time Robert De Niro and Rene Russo have acted together. They previously appeared together in “Showtime” (2002) and “The Adventures Of Rocky & Bullwinkle” (2000). Robert De Niro and Anne Hathaway learned Tai Chi from Tiffany Chen, the daughter of Grandmaster William C C Chen. This is Anne Hathaway’s second fashion film. She previously starred in The Devil Wears Prada (2006) where she played a junior assistant to a powerful fashion magazine editor-in-chief (portrayed by Meryl Streep). In Hathaway’s opening scene, she is seen dealing with a customer on the phone who is to be married in three days’ time. Hathaway’s company has sent the wrong bridesmaid dresses. After assuring the bride that the problem will be solved, Hathaway addresses her as “Rachel” and wishes her the best on her wedding day. Hathaway received her first Oscar nomination, for Best Actress, for her lead role in Jonathan Demme’s 2008 film, Rachel Getting Married. This is Anne Hathaway’s first movie with Robert De Niro. The first time Nancy Meyers and Robert De Niro worked together. Check out The Intern Official Website and Facebook Page! 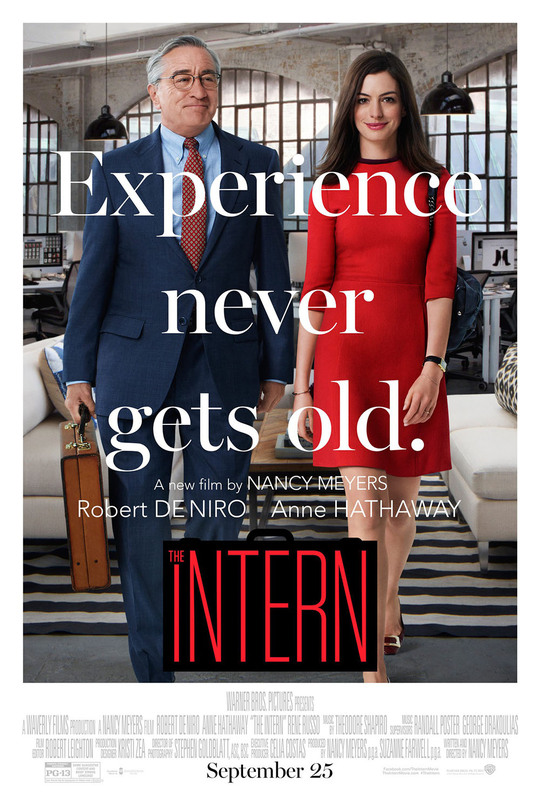 The Intern is out in cinemas on 24th September 2015. I’ve watched this film twice. Really a cool film. De Nero and Miss Hattaway are simply outstanding playing their roles. This is a good movie. Thanks for the info about the movie, I believe the role really fits Robert de Niro than Jack Nicholson. WAIT. Did I miss this movie’s showing here in my country?! If yes, I am totally upset! I sure hope it hasn’t been shown here yet. I loved the trailer for this movie! The Intern is a must watch movie for me & my bff. I hope I can watch this movie this weekend with her. Its so hilarious. I think this move wasn’t shown here. I must download this one. 4 stars! Here’s another great movie that I would love to watch. Anne Hathaway + Robert De Niro definitely made the movie better because of such amazingly talented actors. I am looking forward to this movie and thanks for the review. Hopefully I can watch this movie. Somehow, I did relate it Devil’s wears prada but with Robert De Niro Matching wits with Anne Hathaway. I looks like a great family friendly film that a family can relate to as well as people who work too. I really don’t like Anne Hathaway. She annoys me. But somehow, I end up watching her movies because she does get casted on the ones I’m interested in. I really wanted to watch this! I couldn’t find it anywhere in the cinemas here anymore. Ugh. it was screened a week ago, oh my. I watched this film with excitement inside of me. I can relate to this kind of setting and really for family entertainment. Teaching is a two-way engagement with personalities and motivations. Thanks for posting a review for this movie, I really want to see it but I haven’t had the chance to yet. Hopefully, I’ll be able to watch it ASAP.